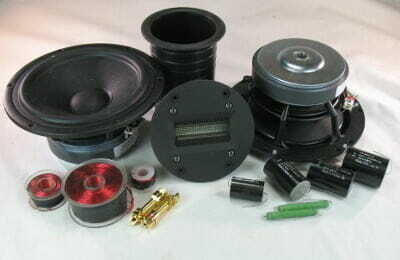 SKU: borbb Category: Speaker Kits Brands: Campbell - Holtz. Jim keeps saying that this is the last speaker build, but it seems they keep on coming. His latest collaboration with Curt Campbell gives the speaker builder a great, high-end three-way design. Jim built on his past success with the Dayton RS225 woofers but did an audiophile upgrade on the mid-bass and tweeter. The very dynamic Accuton mid-woofer results in a quick and detailed mid-range while the air restriction tweeter adds a level of accuracy not well produced by many soft dome tweeters. All crossover parts are what Jim had used in his build. but we have happy to upgrade (or downgrade depending on budget). Please note the photo above doesn’t show the premium CSA caps included in the kit.